in so many words...: Happy Thanksgiving, Everyone! Just wanted to wish everyone a very wonderful day tomorrow even if you're not officially celebrating Thanksgiving Day. Happy Thanksgiving, Yvette! I hope you have a great day. Happy Thanksgiving, Yvette! I hope you have time to enjoy a movie or good book! I hope you have a Happy Thanksgiving, also. And a wonderful Thanksgiving to you and yours! Thanks, Prashant. It's the beginning of the whole Christmas craze which officially begins now on the day after Thanksgiving. There's no holding it back. Ha! Happy Thanksgiving, Yvette! We don't have this holiday here in the UK so it'll be an ordinary day for us. Still, we get an extra holiday (Boxing Day) at Christmas.....so I guess we're equal in terms of breaks! Same back atcha, Yvette. Have a wonderful Thanksgiving holiday with family and friends. And in particular enjoy your granddaughter! Enjoy the feast and spending time with your family, especially reading to your budding book enthusiast. I read her my favorite (and hoping it will be hers when she gets a little older) Thanksgiving picture book, Kathy. We had a good time. Happy Thanksgiving, Yvette; sorry to be running late, but that doesn't mean I'm not sincere! 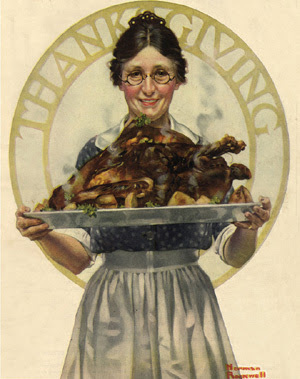 :-) All of us here at Team Bartilucci HQ hope you and your family had a happy and mellow Turkey Day, my friend!